Juan Ponce de León  (Spanish pronunciation: [ˈxwam ˈponθe ðe leˈon]; 1474 – July 1521) , commonly known as Ponce de León, was a Spanish explorer and conquistador known for leading the first official European expedition to Florida and the first governor of Puerto Rico. He was born in Santervás de Campos, Valladolid, Spain in 1474. Though little is known about his family, he was of noble birth and served in the Spanish military from a young age. He first came to the Americas as a "gentleman volunteer" with Christopher Columbus's second expedition in 1493. Juan Ponce de León was born in the village of Santervás de Campos in the northern part of what is now the Spanish province of Valladolid. Although early historians placed his birth in 1460, and this date has been used traditionally, more recent evidence shows he was likely born in 1474. The surname Ponce de León dates from the 13th century. The Ponce de León lineage began with Ponce Vélaz de Cabrera, descendant of count Bermudo Núñez, and Sancha Ponce de Cabrera,  daughter of Ponce Giraldo de Cabrera. Before October 1235, a son of Ponce Vela de Cabrera and his wife Teresa Rodríguez Girón named Pedro Ponce de Cabrera  married Aldonza Alfonso, an illegitimate daughter of King Alfonso IX of León. The descendants of this marriage added the "de León" to their patronymic and were known henceforth as the Ponce de León. 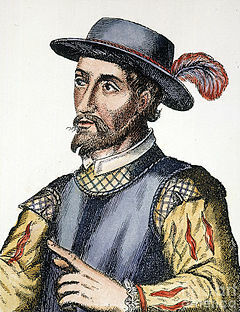 Ponce de León was related to another notable family, the Núñez de Guzmáns, and as a young man he served as squire to Pedro Núñez de Guzmán, Knight Commander of the Order of Calatrava. A contemporary chronicler, Gonzalo Fernández de Oviedo y Valdés, states that Ponce de León gained his experience as a soldier fighting in the Spanish campaigns that defeated the Moors in Granada and completed the re-conquest of Spain in 1492. He married a distant relative of his, Leonor Ponce de León, with whom he would form the first European family living in Puerto Rico. Ponce de León equipped three ships with at least 200 men at his own expense and set out from Puerto Rico on March 4, 1513. The only near contemporary description known for this expedition comes from Antonio de Herrera y Tordesillas, a Spanish historian who apparently had access to the original ships' logs or related secondary sources from which he created a summary of the voyage published in 1601. The brevity of the account and occasional gaps in the record have led historians to speculate and dispute many details of the voyage. Although Ponce de León is widely credited with the discovery of Florida, he almost certainly was not the first European to reach the peninsula. Spanish slave expeditions had been regularly raiding the Bahamas since 1494 and there is some evidence that one or more of these slavers made it as far as the shores of Florida. Another piece of evidence that others came before Ponce de León is the Cantino Map from 1502, which shows a peninsula near Cuba that looks like Florida's and includes characteristic place names. There is a possibility that the Fountain of Youth was an allegory for the Bahamian love vine, which locals brew today as an aphrodisiac. Ponce de León could have been seeking it as a potential entrepreneurial venture. Woodrow Wilson believed Indian servants brewing a "brown tea" in Puerto Rico may have inspired Ponce de León's search for the Fountain of Youth. Arne Molander has speculated that the adventurous conquistador mistook the natives' "vid" (vine) for "vida" (life) – transforming their "fountain vine" into an imagined "fountain of life". Three ships were purchased for his armada and after repairs and provisioning Ponce de León left Spain on May 14, 1515 with his little fleet. The record of his activities against the Caribs is vague. There was one engagement in Guadeloupe on his return to the area and possibly two or three other encounters. The campaign came to an abrupt end in 1516 when Ferdinand died. The king had been a strong supporter and Ponce de León felt it was imperative he return to Spain and defend his privileges and titles. He did receive assurances of support from Cardinal Francisco Jiménez de Cisneros, the regent appointed to govern Castile, but it was nearly two years before he was able to return home to Puerto Rico.